Yesterday, dozens of educators, policy makers and advocates heard from the researchers involved with Getting Down to Facts II, California’s most ambitious education research collection in a decade. Co-hosted by Policy Analysis for California Education and EdSource, the event explored current trends in education including how the state’s Local Control Funding Formula (LCFF) has changed the education landscape. In the four years since the implementation of the formula, there’s been much discussion over the need for additional resources and training for teachers, district staff and community on the new equity-based funding model, yet one thing is clear: Investing more funding in students with the highest needs is working. 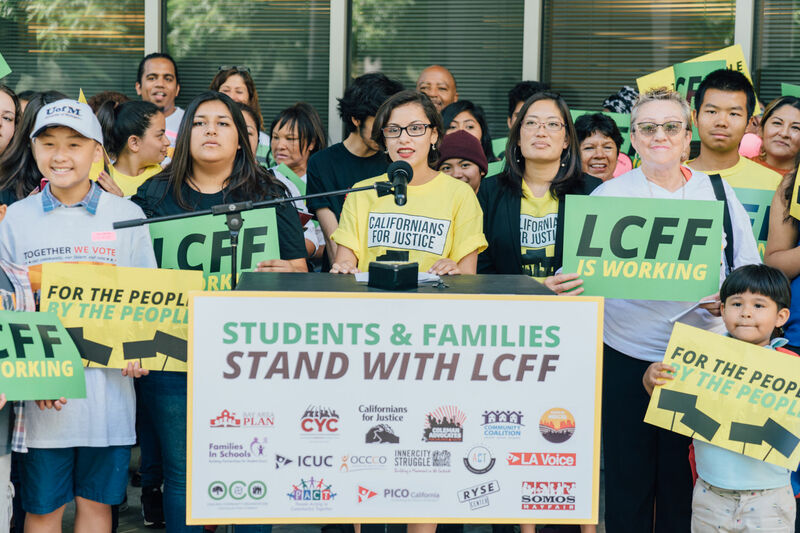 The state’s decision to invest more in Foster Youth, English Learners and Low-Income students through LCFF is historic and the first of its kind in the nation. At Californians for Justice, we firmly believe it’s paying off and appreciate the flood of new data supporting a belief we’ve long held to be true: Investing directly in Black and Brown, low-income, foster youth and English Learners leads to improved academic outcomes. “Since the implementation of LCFF, we have seen increased district spending of $1,000 per-pupil. That’s led to measurable changes in student achievement that is akin to 7 months of additional learning in math,” said Rucker Johnson, Professor at UC Berkeley Goldman School of Public Policy and author of a Getting Down to Facts report. High school graduation rates have also seen measurable gains and if this investment level is increased, we as a state will move even closer to realizing the goal of providing a quality education for all students, regardless of race or zip code. However, to get there we need to continue to push forward questions like why Black students, regardless of income levels, remain at the bottom of nearly every academic achievement measure, or how schools are providing safe and supportive climates for LGBQ, Trans and Gender Non-Conforming students. Using this type of equity lense is vital for ensuring the CA education system sets up our students for success and invests in the future leaders our state needs: Black, Brown, Southeast Asian, Pacific Islander, Filipino, Native Hawaiian, North African, Middle Eastern, Native American, immigrant, LGBQ and TGNC youth. Californians for Justice looks forward to future iterations of Getting down to Facts assessments that more directly lead with an equity framework in order to truly center our highest need students in policy and program recommendations. This also means building Relationship Centered Schools that create connections and build up students’ sense of safety, as well as establishing Racial Justice frameworks in the classroom and school environments. When we invest directly in students who need it the most, we are ensuring all students are given the opportunity to thrive. 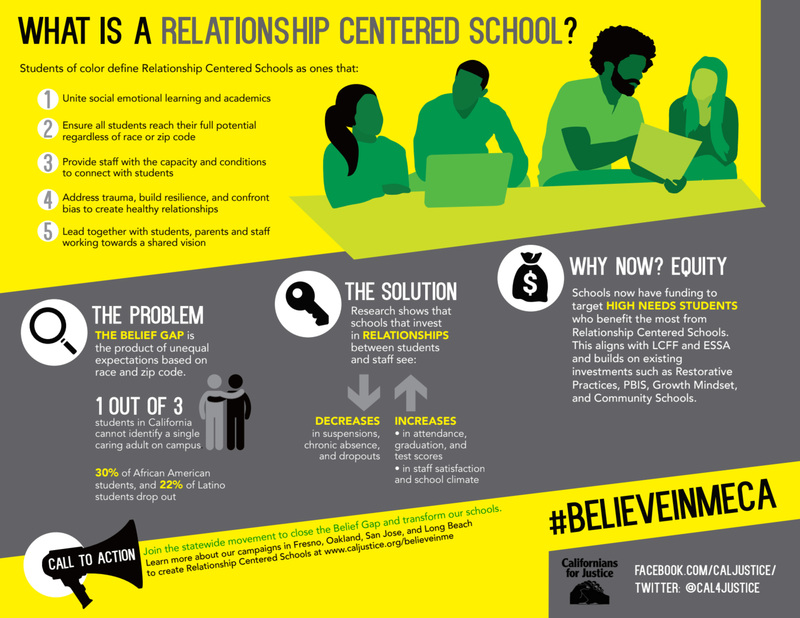 What are Relationship Centered Schools? ← When’s the last time you practiced self-care?